With bank financing for smallish owner-occupied properties still sketchy outside top-tier metro areas, it's no great surprise that small enterprises have been tapping into the Small Business Administration's 504 lending program with abandon of late. With real estate and related fixed assets as collateral, the 504 program allows quite a range of businesses to buy, build and/or expand facilities using long-term, below-market fixed-rate financing. While the widely watched Thomson Reuters/PayNet Small Business Lending Index has been down far more than up over the past couple of calendar quarters, SBA lenders have been extremely busy writing new 504 business. With just September left in SBA's 2012 fiscal year, gross 504 loan approvals total $5.8 billion - up more than 35 percent over the previous 11-month period. And the June-August period has been particularly hectic, as monthly approvals have averaged $655 million - well beyond the overall $525 million average for the nearly finished fiscal year. As many MarketBeat readers know, a 504 loan includes a 50 percent-LTV senior tranche negotiated with a private lender (banks for the most part). A 40 percent subordinate tranche of up to $5 million ($5.5 million in special cases) arranged through a non-profit Certified Development Company is ultimately funded through debentures sold in the secondary market - and guaranteed by the federal government. Borrowers contribute 10 percent equity. And in today's low-yield environment, the latest 10-year 504 debenture bonds sold at another record low - dipping to a double-digit basis-point interest rate of 0.98 percent (2.2 for 20-year instruments). That translates to typical borrowing rates in the 3.5 percent vicinity (factoring in servicing fees) for 10-year 504 loans, and around 4.25 for 20-year transactions. Not bad given that banks willing to fund small-balance CRE and C&I loans tend to limit proceeds to maybe 70 or 75 percent LTV - with borrowing rates typically hundreds of basis points higher. So why would business owners seeking to acquire, develop, expand - or refinance - facilities look to banks or elsewhere for funding if 504 rates and terms are so attractive? Because two temporary stimulus-tied provisions of the 504 program - both helping drive the recent activity surge - are scheduled to sunset on Sept. 27. Congress could extend them - a highly unlikely scenario at this point. Or it could revive them after the election - likewise a shaky proposition given the political climate. The provision allowing business owners to refinance existing non-SBA debt under certain circumstances has predictably proven quite popular amid crunched credit - or at least it has been since administrators made some important tweaks expanding eligibility (see previous MarketBeat story). 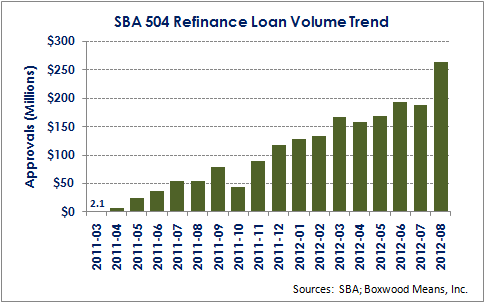 SBA has approved a total of $1.91 billion of 504 refinance loans since the program's inception in early 2011, with roughly 85 percent of this total accumulated in this fiscal year alone (see the nearby graph). While approvals averaged $126.0 million over the first eight months of the current fiscal year, production has jumped to an average of $214.8 million over the last three months as the expiration date approaches, according to Agency data provided to SmallBalance.com. The Southeast and Midwest regions have clearly been the most active, with the pair accounting for more than $900 million in transactions so far - nearly half the program's total since inception. In recent testimony on behalf of the Consumer Bankers Association before a subcommittee of the House Committee on Small Business, Timothy Dixon, the senior vice president heading Citizens Bank's SBA lending, stressed that still-slumping property values and still-stingy bank lending combine to make the 504 refi provision essential for a lot of owners facing maturities. "The need for this program is even greater now as many owner-occupied commercial real estate loans are set to mature over the next year from purchases made over five years ago," Dixon related. "This program is critical to small businesses that need to refinance their property but can only do so with the higher leverage offered by the program… if it disappears we will be taking a step backwards," he pleaded. Likewise, a lot of senior 504 lenders have taken advantage of the temporary First Mortgage Lien Pooling (FMLP) program, which has allowed them to sell up to 85 percent of senior loan dollars into the secondary market through a federally guaranteed pool. This further cuts borrowing rates while also freeing up bank balance-sheet capacity for additional lending. SBA 504 specialist Mercantile Capital Corp. estimates lenders tap the FMLP provision with about 15 percent of all 504 loans being funded of late. More importantly it's one of few attractive financial resources available today for owner-users of certain special-purpose facilities that banks and other lenders continue to generally shun. "The FMLP program has become the only viable financing source for assisted-living facilities, daycare centers, auto repair shops, restaurants and hotels because conventional lenders generally won't finance these types of properties," Mercantile's CEO Chris Hurn blogged. "Dozens of small business owners we've worked with this year wouldn't have been able to get funding without one or both of these programs," Hurn added, referring to the 504 FMLP and refi provisions. Hurn in fact is distributing a petition seeking extension of these provisions, directed at members of the Committee on Small Business as well as Senators Mary Landrieu and Olympia Snowe of the Senate Small Business & Entrepreneurship Committee. Meanwhile again, while there's certainly been some improvement of late in the US banking sector's financial health and originations volume, the benefits aren't necessarily trickling down to small-balance borrowers - yet. The fact is that many commercial banks remain hamstrung with problem loans well after the end of the Great Recession. Collectively, they still hold well over $300 billion in 90-day delinquent loans (real estate-secured and otherwise). And while delinquencies of CRE-secured bank loans at mid-year were at their lowest point since the end of 2008, some recent studies strongly suggest smaller banks hold a disproportionate share of the distress. A recent analysis by economist Elizabeth Laderman of the San Francisco Federal Reserve Bank concludes that portfolios of business loans in the $1-million-and-under range are generally shrinking at small banks, due to the disproportionate ratio of financially weak institutions categorized as small. The better news is that originations of $1 million-and-under C&I loans have started growing at healthy small banks - perhaps signaling a rebound in borrower demand. Another report from Chandan Economics states that smaller regional and community banks, especially those in smaller markets, are lagging their larger peers in terms of loan performance. It also notes that most small banks remain "in retreat" with respect to loan originations even as overall bank lending increased during this year's second quarter. Given the evidence of still-fragile, small business real estate lending among banks, it appears as autumn unfolds the sunset provisions of SBA 504 will leave many willing participants out in the cold.